From the movie "Confessions of A Shopaholic"
I don't know about you but I have always found handling money a bit challenging. Especially when it comes to budgeting and when you see those flashing S-A-L-E signs at your favorite shops! Its sooo hard to resist eh? With all the sale items out there begging to be bought (sighs), the temptation to give in and use your shiny trusty credit card to give you immediate satisfaction can be quite strong. Then you slowly find yourself wallowing in a sinking hole of credit card debt because you just can't miss out on that "last day sale" for the nth time. Personally, I stir away from credit cards. I know me. (haha) I know that it would be very difficult to resist the temptation to NOT use my credit card and only during emergencies. The idea of me with a credit card is scary. Which is why I'm so glad that I haven't come to the point like the story in "Confessions of a Shopaholic." Remember THAT scene? hehe. But seriously, do you really wanna wait until you get to the point of "no return"? Well there is good news for those who want to break free from all the stress of your money woes! Reputable wealth coach, lifestyle trainer, and former tv personality Chinkee Tan is giving a lecture on two Saturdays on August 13 and 20, 2011, from 2 to 6 P.M. at Victory Metro East, Level 5 West Wing, Robinsons Metro East, Marcos Highway, Pasig City. On August 13, its all about the lecture entitled "Break Free from Financial Stress" aka "Personal Finance 101: Strategies on how to get out of the debt" which aims to help everyone (that includes you my dear coffeeholic reader! ), particularly students, parents, enterprise owners, and business enthusiasts to understand and put into practice the correct craft of money management. On August 20, the title of the lecture will be "Rich God, Poor God: Why God Wants You to Prosper." Interested participants are encouraged to register at the soonest time possible in order to avail an 85% discount on ticket price (from 3,500 to 550 pesos), not to mention the chance to take home a free copy of Tan's best-selling book, "Till Debt Do Us Part." To register you may visit call up 477-1212 or 645-1212. Limited seats only! The coolest part of this seminar is that its FREE for all bloggers! Just go up to the registration booth and tell Ms. Robelo that you are a blogger. Or better yet, register in advance by calling them up using that number. 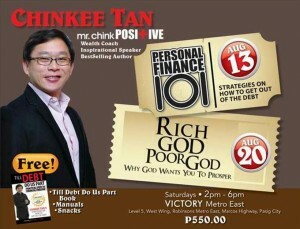 So grab this opportunity now and you might also get a "free" copy of Chinkee Tan's most recent book about finances. So my dear coffeeholics, are you going? If you are, do please comment below and let me know ok? I'd love to chat up with you there! Yes it looks like I'm going. Knowledge is power y'know! See you there, Mwah! P.S. For more information, you may visit their website Chinkeetan.com.